The Derby and Leicester franchises of Speedy Freight have been taken over by Gary Sawyer, who already operates the Bolton, Wigan and Oldham franchises. 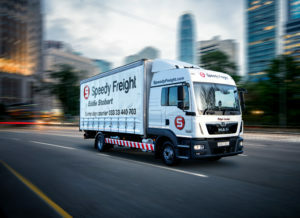 Speedy Freight, which is part of Eddie Stobart Logistics, provides urgent freight deliveries from some 60 franchised depots around the country. It operates some 4,000 vehicles ranging from artics to vans. The new franchise will be based at Castle Donington. “We are recruiting now for up to 30 drivers – mostly of small vans. We will also be taking on up to nine office staff over the coming months,” said Sawyer.